Like all great artists, I have decided to rip off an idea. My sister, who is better than me at just about everything (especially encouragement) wrote every day in October about music that moved her. I, on the other hand, grew increasingly silent in this space. This is for some highly personal reasons that I am working through, but I also still feel drawn to write. Just this afternoon, while sitting in a class on theology, I decided to do what she did (even though I’m starting way late). So for the next period of time—not sure yet—I’m going to write about songs that are impacting me. Again, I won’t say much, but this recent season has been a rather intense one in my life, so there’s a lot going on. Also: get ready, because my tastes certainly run the gamut. You can hear the songs here. The first song on the list is “The Healing Day” by Bill Fay. By nature I am a melancholy person. Most of the time it’s not really that big of a deal (except for the fact that I’m called “Eeyore” at work). However, every so often—maybe once ever 18 months or so—the bottom drops out, and I enter a pretty big skid. I went through a pretty big one—at least 24-30 months—when we first moved to Tallahassee, but I had not really drunk from that bitter cup since then. Maybe it was just seasonal; maybe it was something I did or didn’t do (truth is, it was/is probably a result of a combination), but “The Black”, as I sometimes call it, hit me forcefully in October. There were plenty of days that I limped through (with varying degrees of success), and the struggle was fierce for a lot of it. Monday, November 3 was a particularly difficult day. I was in Orlando for a class, and for a variety of reasons I was just in a tailspin. “Despair” is not a word I use lightly, but in this case, well, it fit. As I drove around northeast Orlando for lunch, this phrase popped into my head, and I found this tune on my phone and pushed play. 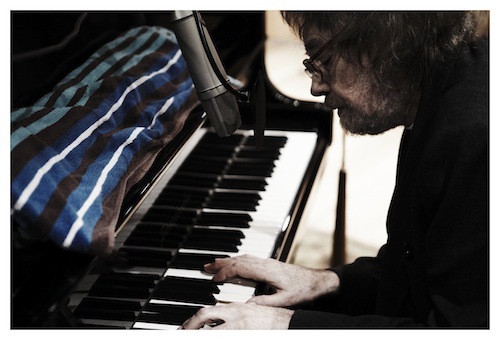 Bill Fay is an English singer/songwriter. Though he did most of his work in the 60s and 70s, he released a record—Life is People —in 2012. I remember hearing the title track and instantly thinking, “Wow, this guy really influenced Jeff Tweedy.” The music is simple and gentle; the word “pastoral” comes easily to mind. I really don’t know a ton about Bill Fay other than these two songs, but they are a good soundtrack when I am trying to “deal gently with myself,” when I am trying to forgive myself and live without shame (which for me is a struggle). Sometimes I don’t want music to wreck me; I do a find job of that on my own. Sometimes I want music to help put me back together again, or at the very least just remind me that I’m “okay” even when I am in pieces. “Healing Day” is not going to be musically revelatory to anyone; it’s pretty simplistic. However, it’s like a great big gentle hug from a good friend or family member when I need it most. This entry was posted in art // music, personal and tagged bill fay, creativity, depression, music. Bookmark the permalink. I’m really glad you’re doing this, the daily discipline of writing. There’s great power in the places the music will push you and in the things uncovered. This is a gentle, grace-filled song. I am sitting at my workplace crying. There is much hope. And, TBH, I didn’t make every day this time. I skipped a few.